February saw the launch of BlackBerry 10 in most countries (besides the United States), so I figured that it would be worth taking a look at which countries BlackBerry 10 users are in. Canada (unsurprisingly) lead the way with 62% of BlackBerry 10 users. 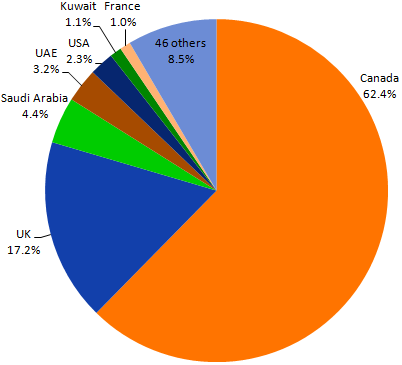 It was followed by the United Kingdom with 17% of users, and then a collection of middle eastern countries, such as Saudi Arabia, UAE, Kuwait, and Qatar. Surprisingly the United States managed to have a bit of a showing despite not yet being formally launched in that country. This data for this chart was taken from downloads of the free BlackBerry strategy game Pixelated over the course of February 2013, and excludes Dev Alpha devices.